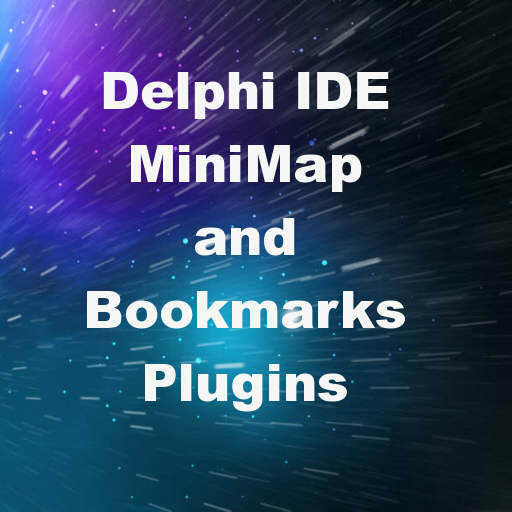 Developer David Millington from Parnassus has released a couple IDE plugins for Delphi XE8 including a MiniMap, a go to code window, and bookmark functionality. The Bookmarks plugin is free and you can download it here. The MiniMap and go to code window are part of a plugin called Parnassus Navigator. If you haven’t seen an IDE with a minimap before then basically it is a small version of the entire source code file to the right of the code window next to the scroll bar. It acts as a scroll bar itself except instead of just being a single color it contains a mini version of the source code. When you know your source code you can quickly navigate using the minimap to relevant portions of your code. If you hover your mouse over a portion of the minimap you get a hint popup of just that section of the code without actually navigating to that section. The second piece of the Parnassus Navigator plugin is the go to code window which pops up when you press CTRL+G. It is a searchable list of all of the procedures, methods, variables, etc. in the current source code. You just start typing the name of what you are looking for and it filters the list. Select the item that you want in the list and the editor jumps to that piece of code. I’ve already started using it as a replacement for the Find functionality. The Parnassus Navigator plugin is a commercial plugin but it comes with a full featured free trial. Using these plugins can increase productivity when you develop your Android, IOS, OSX, and Windows apps in Delphi XE8 Firemonkey. Head over and check out the full blog post about the Parnassus Navigator plugin for the Delphi XE8 IDE and then download the free trial.